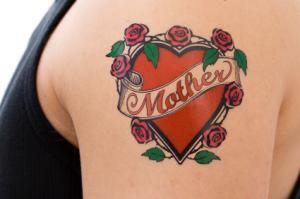 Old school is the name given to some styles of traditional tattoos dating back to the 1930s. Images include those designed by Sailor Jerry, as well as other prominent artists of the day. The coloring is almost always primarily black ink with accents of red, blue, yellow and green with very little shading. The colors are pure and vibrant, with little mixing. Many old school designs are just as popular today as they were in decades past amongst tattoo enthusiasts. Old school tattoos are typically made up of some very classic images that were at the heart of this era. As one of the more obvious symbols of people who spent time at sea, ships were a popular choice for sailors seeking tattoos. One legendary piece is Sailor Jerry's portrayal of a ship at sea with the word "Homeward" beneath it accompanied by splashes of vibrant red in the background as though devotion and fury fueled the ship's progress. Similar to the ship, an anchor indicated participation in the U.S. Navy. Men would frequently opt to add a ribbon with the name of their beloved written on it wrapped around it, implying that their loved one served as an anchor in their life. The nautical star served as a patriotic symbol of service in the Navy. It's also a very popular sailor and old school style tattoo. 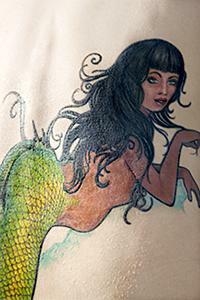 Mermaids were mythical creatures of the ocean and many sailor's fantasies. These tattoos usually revealed bare, pert breasts that often symbolized the lust and desire the wearer had for women in general. The naked temptress could take on many forms. She might be positioned lying invitingly in a hammock or staring seductively at an observer while a cobra circled her half-naked body. A naked temptress represented passion and lust. She may also be accompanied by symbols of gambling and drink. With passion and lust came heart imagery. Sometimes these red hearts were intact, other times they were split in half or stabbed with a dagger and imprinted with words like "broken", "courage" and "regret". One of the authentic naval tattoos, a swallow is said to symbolize a certain number of miles the sailor has journeyed at sea. The swallow was considered the first sign that land was near, implying that the sailor had completed his mileage and was finally arriving at his destination. As the national symbol of the United States of America, the eagle easily became one of the popular old school tattoo designs for many patriotic tattoo enthusiasts. The national flag serves as another patriotic representation for tattoo enthusiasts. The influence of old school tattoos on contemporary tattooists and aficionados dates back to times of war, debauchery, buxom temptresses and red-blooded men. Legendary tattooists such as Charlie Wagner, Lewis Alberts and Norman "Sailor Jerry" Collins branded America during the World War era using straightforward illustrations, bold dark lines and alluring artistry that would evoke opinions of scandal and rebellion among tamed and domesticated onlookers. Born of hands that had partaken in world-travel, adventure and warfare, old school tattoos served as marks of bravery, lust and emotional conflict. They were commonly etched into a forearm or bicep, unflinchingly announcing the wearer's experiences and thrilling encounters that were worthy of commemoration. With the resurgence of the tattoo culture in the past few decades, old school tattoo flash styles have been a top choice for many enthusiasts. Contemporary artists such as Ed Hardy, Paul Jefferies and Mike Malone revived the tradition of old school tattoos while adding in present-day themes and personalized depictions (such as Asian artistry and American Indian themes). 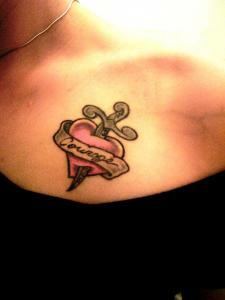 The vintage style has actually become highly-sought after and trendy for numerous individuals seeking their next tattoo.